UNP Deputy General Secretary Education Minister Akila Viraj Kariyawasam, yesterday, said the removal of UNP leader Ranil Wickremesinghe hadn’t been envisaged as part of the re-structuring process of the party scheduled to be completed by April 30. 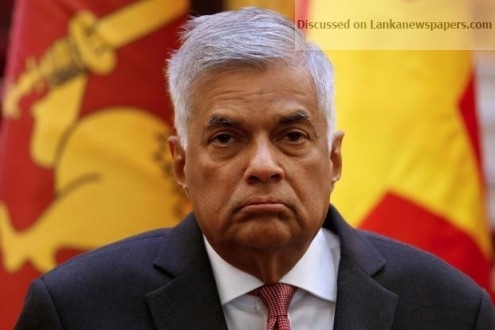 Addressing the media, at his residence in Colombo, Minister Kariyawasam said the UNP Working Committee and UNP parliamentary group had on Saturday (07) decided that the leadership should not be changed. Minister Kariyawasama said that according the UNP constitution the UNP member who held the post of either the President of the Prime Minister became the ex-officio party leader. Therefore, all other positions, except the post of leader would be changed, the minister said. According to the Minister, a 12 member-committee has been appointed to recommend appointments of new office bearers of the party. The members of the committee are Naveen Dissanayake, Ajith P. Perera, Harin Fernando, Akila Viraj Kariyawasam, Eran Wickremeratne, Ruwan Wijewardene, Mangala Samaraweera, Ranjith Madduma Bandara, Gayantha Karunathileka, Nalin Bandara, Asoka Priyantha and J.C. Alawathuwala are the newly appointed committee members. However, UNP leader and deputy leader would also join the committee. Kariyawasam said that several MPs had called for the change of the top leadership though the majority wanted to go with the present party constitution. “I am aware the General Secretary, Treasurer and Chairman have already tendered their resignations to facilitate the restructuring process,” Kariyawasam added. Younger members would be given more powers and the newly appointed 12-member permanent committee would help the party to reach consensus on contentious matters. Prior to the No-Confidence Motion (NCM) against Prime Minister Ranil Wickremesinghe, the State Minister Palitha Range Bandara and Wasantha Senanayake called for Wickremesinghe’s removal. However, on April 04, few hours before the voting on NCM, Bandara and Senanayake declared their support for Wickremesinghe on the basis they received an assurance of complete restructuring of the party. Minister Bandara has been appointed a member of the special committee of the UNP.